Last week at Circles Conference, there were so many fun new and exciting things we walked away with. Everything from new relationships to new thoughts to new inspiration. It was refreshing and the perfect way to end the time we have taken for ourselves to plan for what’s next. Throughout the conference, I kept hearing about how so many started down a path that ultimately wasn’t them or may have gotten lost along the way while trying to define their path. We watched as a few amazing transformations of people were shared. They talked about defining their path, focusing, and making big leaps in their career by simply choosing to no longer stay where they thought they found themselves and had been made to believe they should be. That thought has stuck with me and made me ask some critical questions as we end these few weeks. We are excited to be heading home today and jumping back into work on Wednesday. It is great to have this new thought in our back pocket. It is easy to get caught up in what we think we should be. Maybe for you it’s growing a larger company, having a full-time job, studying a certain topic, living in a particular place, dating a certain person, having specific friends, talking about certain topics, the list goes on and on. The truth is we have to ask if those things are actually leading us to where we are meant to be. I do know that the in the last few weeks we have recognized the clutter and need for focus in our work and path. It isn’t easy to identify, but time away can do amazing things, which I cannot wait to talk about as I have more time to process fully the last eight weeks. That said, I want to begin your Monday by asking you to think about where you are and where you find yourself, are you doing what you feel meant to do and does it fulfill you? Or are you doing what you believe you are supposed to do? These questions can be asked and applied to so many different parts of your life. 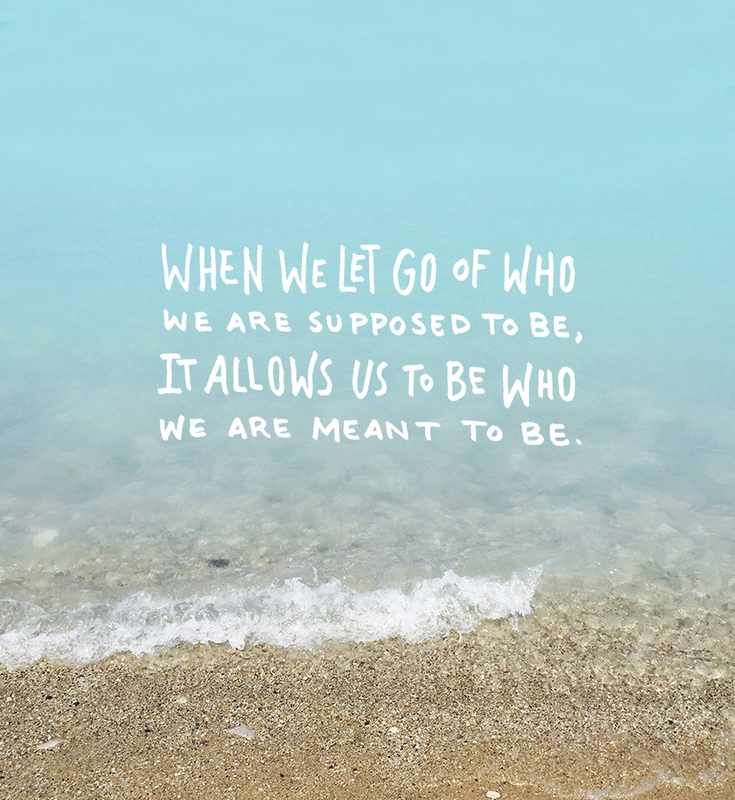 There is such freedom when we recognize the parts of our life that lie in the “supposed to” category and release them. If we instead fill them with the things we feel we are meant to do, overtime it can make a HUGE difference. Little by little with great focus changes can happen. Soon you will find yourself living a life that feels as if it’s your own and not the world’s, your friend’s, your boss’s, your parent’s, and so on. Remember, that no matter what you do, there is a way you can do it your way. All you have to do is choose to be brave enough to recognize the places that hold you back from going for it. Happy Monday friends, I apologize for being a little light on content, we have been busy with conference stuff. Being pregnant, introverted, and jumping back into work was more exhausting than planned. This is a great Monday mAntra to remember. I can certainly relate to feeling like i was going down the wrong career path and not knowing exactly how to make the change i needed. Sometimes it’s important to just take a small step until you can see the larger picture. THank you for these beautiful words! This is exactly what I needed this morning! Lately, I’ve been struggling with the two different paths you mentioned — what we’re meant to do and what we’re supposed to do. My heart is pulling me in the direction of carving out my own career through freelancing, however, my mind is telling me what I’m supposed to do (which is to work a 9-5). It’s definitely a challenge, but I’ve found once I’ve sat back and stopped worrying about where I’m supposed to be, opportunities tend to pop up. I’ve really enjoyed reading your blog and it’s been a HUGE source of inspiration for me. I absolutely love that you have connections to Michigan, and it’s been really fun following your journey. I think it’s really great that you’re sharing how beautiful Michigan is. I hope that it attracts more people to this beautiful state! Have a wonderful week! Thank you again for sharing these thoughts! Yes, yes, yes! I wrote a post about this exact thing recently, as I found I had been FOLLOWING the path of ‘should’ and ‘supposed to’ rather than following what lights me up. Ah, so good! I am currently in the midst of what feels like a rebirth and am grateful for the time to consciously think through who I am and who I truly want to be. Thank you for helping the cause 🙂 and welcome home!